This asymmetrical tower is one of the few prominent buildings in New York to have a mix of facades. 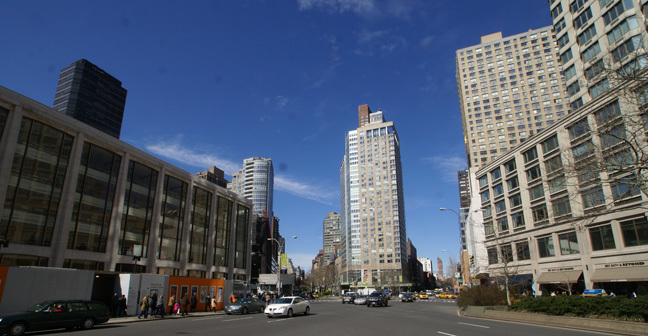 At the north end of the intersection of Broadway and Columbus Avenue at the Lincoln Center for the Performing Arts, this quite striking, 30-story building was erected as a condominium in 1997 by Millenium Partners, developers also of the buildings directly across Broadway and 67th Street. Millenium Partners is headed by Philip E. Aarons, Christopher M. Jeffries and Philip H. Lovett. The building has a low-rise base at the north end of the full-block site that houses an Eddie Bauer store. The base of the tower on 66th Street has a large Barnes & Noble store. The asymmetrical slab tower was designed by Gary Edward Handel + Associates with Schuman, Lichtenstein, Claman & Efron as architect of record. It has 180 apartments. The rear of the tower has a center indentation. At first glance, this appears to be just another mid-rise apartment tower, but its design is quite rigorous and varied and interesting. Despite the area's hubbub, this tower offers great views and a great location surrounded by major retail and the convenience of Lincoln Center. 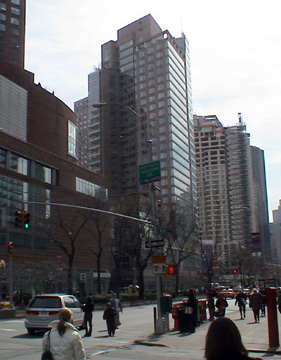 At the north end of the intersection of Broadway and Columbus Avenue at the Lincoln Center for the Performing Arts, this quite striking, 30-story building was erected as a condominium in 1995 by Millenium Partners, developers also of the buildings directly across Broadway and 67th Street. Millenium Partners is headed by Philip E. Aarons, Christopher M. Jeffries and Philip H. Lovett. The asymmetrical slab tower was designed by Gary Edward Handel + Associates with Schuman, Lichtenstein, Claman & Efron as architect of record. It has 143 apartments. 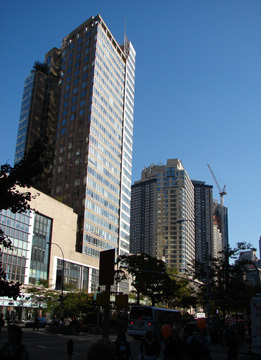 One Lincoln Square is the second of the three major apartment towers erected by Millennium Partners at the north end of the intersection of Broadway and Columbus Avenue just to the north the Lincoln Center for the Performing Art. 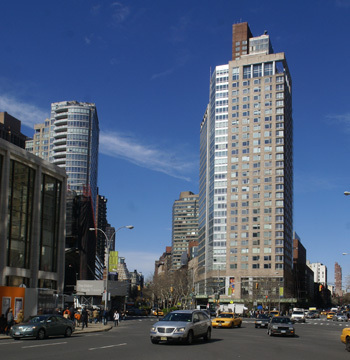 The first was the Park Millennium, the name of the residential condominium section of the 545-foot-high, mixed-use tower that occupies the full block bounded by Broadway, Columbus Avenue and 67th and 68th Streets. It was originally called Millennium Tower and was developed by Millennium Partners and completed in 1994. It was designed by Kohn Pedersen Fox, Gary Edward Handel & Associates and Schuman Lichtenstein Claman & Efron and it replaced the four-story Ansonia Post Office building that had been designed by H. J. Feldman in 1955. The three buildings are known collectively as Lincoln Square. While the design of One Lincoln Square also incorporated a large red-brick masonry base at 67th Street similar to that at the Park Millennium, the tower, placed at 66th Street, had a much more modern glass and metal façade. One Lincoln Square replaced the 4-story Lincoln Square building that had been designed by Louis C. Maurer in 1906 and the two story Colonial Bank designed by Alfred H. Taylor in 1898 that later was used by Bank Beumi and was rebuilt for Bankers Trust by Oppenheimer, Brady & Lemrecke in 1963. The third building of the Lincoln Square complex, the Grand Millennium, was also a rather modern looking 32-story apartment and retail building on the west side of Broadway between 66th and 67th Streets. 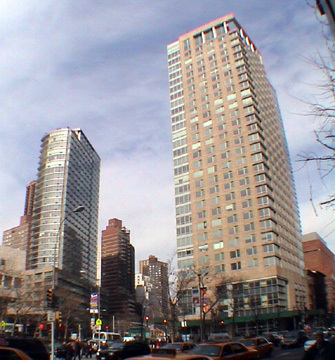 While the Millennium Tower is marred by its unattractive masonry base, all three Millennium Partners' buildings here significantly reinforced the Lincoln Center district with their expansive retail spaces that included a large Barnes & Noble bookstore at One Lincoln Square and until 2007 a huge Tower Records in the Grand Millennium. The crowds attending the movie theaters at the Millennium Tower give a constant pedestrian traffic to an area otherwise congested mostly at curtain time at Lincoln Center. Together, this area is surpassed in liveliness only by Times Square and its Theater District.